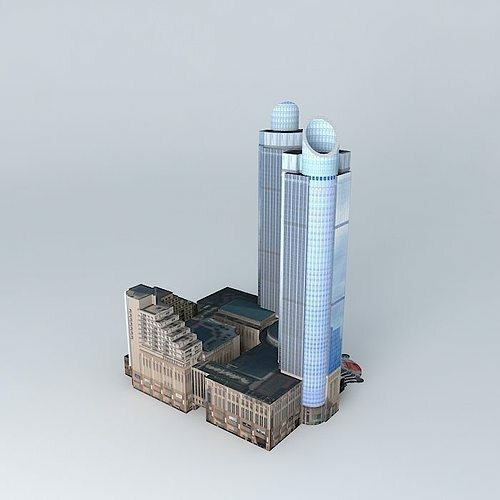 This 3D model was originally created with Sketchup 8 and then converted to all other 3D formats. Native format is .skp 3dsmax scene is 3ds Max 2016 version, rendered with Vray 3.00 Gateway Plaza (Grand Gateway) is a large-scale integrated projects by the Hong Kong Hang Lung Group's principal investment and management. It is located in Huashan Road, Hongqiao Road side of the junction, Xujiahui subway station roof, overlooking the Shanghai Xujiahui commercial center of the region, with a total area of ​​400,000 square meters, with a total investment of 5.5 billion yuan. Grand Gateway Plaza project was designed by American design firm Callison, commerce and trade integration, support the modernization of office space, business suites and residential three functions, Trinity, professional mutual, embraced appearance. According to the specific use of functional distinction, Grand Gateway Plaza shopping mall, Grand Gateway Twin Towers type of Grade A office space, Grand Gateway Service Apartment for top foreign apartments. Gateway Center towers office buildings, each seat 225 m (51 floors) tall.